When shopping for engagement rings, there are several types of gemstones to consider besides the traditional diamond. The stones in moissanite engagement rings have a different type of brilliance than a diamond because there are different faceting patterns for each stone. Natural moissanite is rare because it is a naturally occurring mineral found in meteors. Stones of this type for rings are created in a laboratory and they are composed of silicon carbide. The man made stones are a diamond simulant and are almost as tough as the real thing. 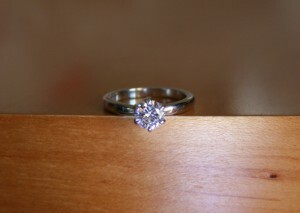 The stones are as just as beautiful as diamonds but they are far less expensive. These glittering stones are becoming a popular choice for many couples. The cushion cut solitaire engagement ring with a moissanite stone features the center stone set on point. Two rows of a decorative beading design adorn the band on each side of the solitaire stone. This simple and understated ring is available in both 14k white gold and 14k yellow gold. The ring is available in sizes 4 to 10. This princess cut solitaire ring has round moissanite accent stones. The ring features a raised cathedral setting. It has an open work design at the top of the band under the setting for added charm. The polished finish of the band offers the ideal backdrop for the solitaire center stone. The band is available in 14k yellow gold or 14k white gold. The wide bezel setting holds the solitaire oval center stone beautifully. Accent lines adorn the setting and complement the center stone on this modern looking ring. The center stone is nestled in the bezel setting providing a striking look. You can choose either 14k white gold or 14k yellow gold for the band color. This ring features a braided design on the band. The braiding adds sparkle to the traditional solitaire ring design. 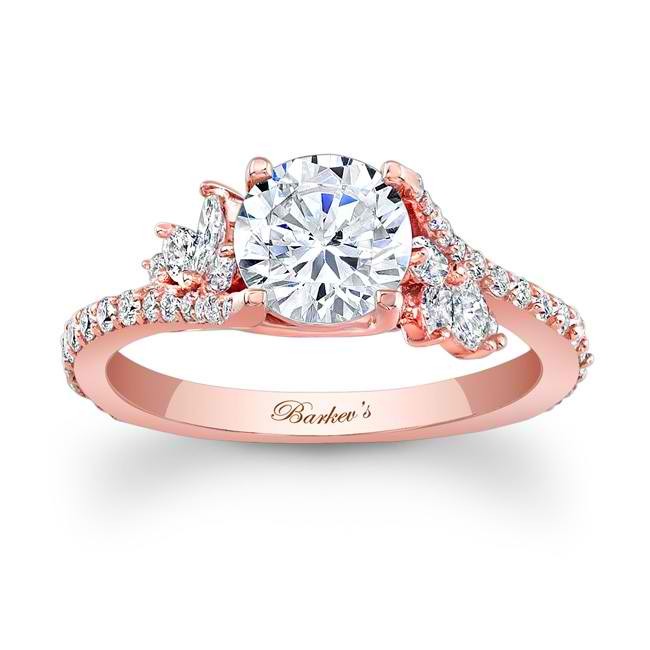 The four prong setting holds the round solitaire stone in place for a sparkling center to the ring. Available in both 14k white gold and 14k yellow gold, the ring has a high polished finish. For a variation of the traditional solitaire center stone, this heart shaped moissanite stone radiates romance. The stone is nestled in a raised setting with an open worked detailing. The slim band is the ideal display for the feminine single heart stone. The ring looks lovely in either the 14k yellow gold or 14k white gold band color. This two tone band is 14k white gold with 14k yellow gold accents on each side of the solitaire oval center stone. There is a decorative leaf pattern in the gold accents. The band has double rows of ridges on each side of the oval moissanite that go gracefully down the band. An open worked design adds charm to the setting. This buckle design solitaire ring features a double row of beading. The rows of beading surround the round solitaire stone forming the buckle. The high polished band is wider to accommodate the unique buckle design. The ring has a modern look and is available in both 14k white gold and 14k yellow gold. The two tone halo engagement ring features a cushion cut center stone. 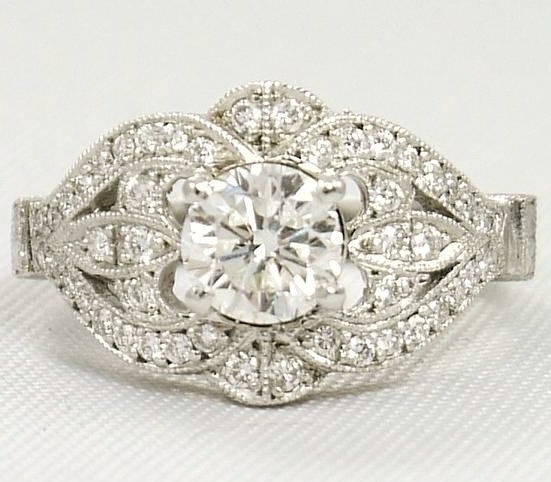 Smaller round accent stones surround the center stone forming a square halo. The 14k white gold band is accented by the 14k yellow gold on each side of the band. The two tone band is accented with decorative feathering lines. The gently curved band on this princess cut ring adds charm and style. The solitaire center stone is nestled between the two edges of the band. The single stone sparkles from the elegant setting. The band is available in 4k or 18k white gold, yellow gold, and rose gold as well as palladium. You are able to choose the stone size from 1.05 ct, 1.36 ct., or 1.72 ct. The elegant Tiffany style moissanite engagement ring features a single center stone. The raised setting displays the traditional solitaire stone beautifully as a symbol of commitment. The ring has a prong setting and high polished finish on the band. Options for the band are 14k rose gold, white gold, two tone gold and 18k rose gold, white gold, or two tone gold.